For all photographers, it is important to ensure a combination of having the right printer, suitable inks and the correct photo paper. However, with the abundance of available choices, it is often confusing to pick out exactly what you need. Ideally, you would need a printer that has the right balance of quality, cost and specific features depending your photo printing demands, and whether you are an amateur or a professional, you want feel satisfied with your work so you need to choose options that show your work in the best light. For an aspiring photographer a printer such as the Canon PIXMA iP8720, would allow you to experiment with colour as well as black and white prints. And, it supports up to a 13” x 19” print size. For a relatively low cost option, it has an incredible 9600 x 2400 dpi resolution, which is perfect for those highly detailed photos. For professional photographers out there, the Epson SureColour P800 is a great option. Not only is it relatively cheap, but has great print quality and a good page yield. Allowing for a wide-format use, it enables printing up to 17” x 22”. Great for printing border-less photos. Most printers have universal compatibility, but it is important to see what type of photo paper your printer can take. As for high quality photographs Inkjet printing is ideal, so we will discuss now discuss Inkjet photo paper. There are various photo paper finishes, which is the translucent chemical coating that improves appearance of the print. From glossy and matt to satin and pearl and luster and various other finishes, you need to choose the correct one for your particular print job. Glossy paper ranges in glossiness, however there may be glare in the resulting image from high glossy papers which make viewing challenging. Nevertheless, glossy paper is the most widely used type of photo paper for a quality finish. Matt has no glossiness, making it a cheaper option (due to the lack of the expensive coating), but ideal for black and white photos. Satin paper has ‘semi-gloss’. Pearl and Luster has a textured feel to it and is a type of satin finish. A high paper density (GSM weight) is ideal for a luxury look, for example on greeting cards, but is often not cost effective. 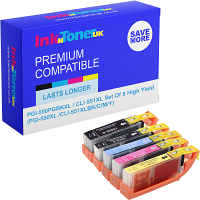 Ink n Toner UK are doing an offer this week of 2 free packs of glossy photo paper when your order comes to £20 or more! Ends midnight on Friday the 18th of January 2019. It is often the question whether it is better to produce your photos with dye or pigment based ink. Dyes are colourants dissolved in liquid while pigments inks are microscopic specks of solid colours that are suspended in liquid. You might use dye as it is cheaper and great for vivid prints. Dye is ideal for album photography, and the best results are on high gloss paper. But they could take a while to dry and will fade over time. Photos printed using dye inks last for about 25 years if protected by glass. Pigment inks are only for the top-end printers, and can produce high quality on a range of paper. They give long lasting and consistent results but lack in vibrancy. This entry was posted in Ink and Toner News by Loga Mathangi. Bookmark the permalink.